Posted on 13 April 2014 at 18:43 in Ham Radio. The first two antennas are on the workshop roof with the help of my little helper Nathan and my big helper Sam. Sam got on the roof yesterday and mounted the antennas for me; I got most of the way up the ladder when my knee told me that going further was a terrible idea. The cables were just sort of dangling afterwards, so Nathan & I got to work today. After some knee stretching last night, I was able to get up and down the ladder reasonably alright today to attach the coax to the wall; it at least wasn’t shaky like it was yesterday. Once we got to the end of the workshop, there was about a 5 or 6 foot gap that needed to be spanned. I put a couple eye bolts, one in the house, and one in the workshop, and stretched across some 1/8″ cable. I was originally going to use rope, but when I was in the rope aisle of the hardware store looking for something relatively UV resistant, it occurred to me that cable should be about as UV resistant as it gets. 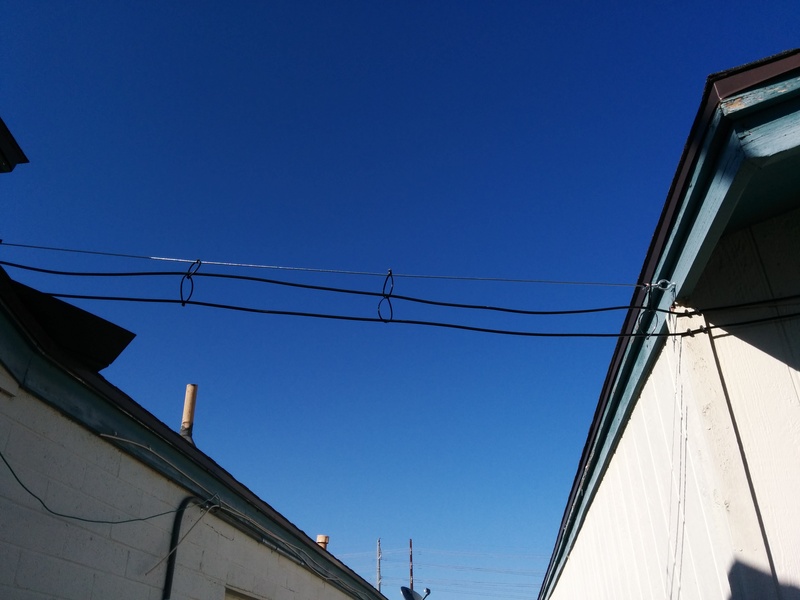 I suspended the coax from the cable every couple of feet with zip ties, and as Jenn pointed out, I’ll probably need to replace those zip ties every 2 or 3 years as the sun cooks them, but that should do for now. The last step was to get the coax into the house. 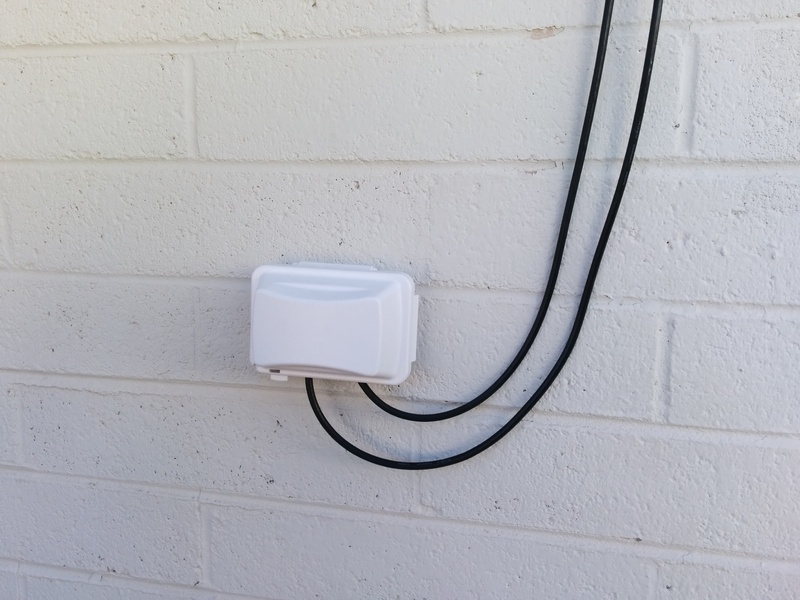 For this, I chose to use an outdoor rated outlet cover that’s designed for leaving cords plugged in, so there’s a couple small openings in the bottom the coax enters in. 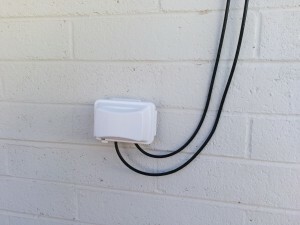 That’s attached to the house with blue screws, and I need to pick up some caulk and go around it just to finish it up. 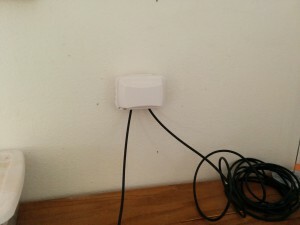 The box has a gasket that seals it against the wall, but a little caulk is a good idea too. Drilling the hole through the brick was a real pain, but after getting an initial hole in, I was able to chisel out around it until it was an appropriate size. I figured the same outlet cover should work on the inside of the house, so I mounted it with drywall anchors, and then Nathan & I fed the cable through the wall. Now we just need to test things out. To do that, I’ll need to get a computer close enough to that side of the house to try receiving weather satellite images, and I’ll also need to find someone nearby who can work 2m & 70cm to test out the dual band antenna. Finally, I’d like to make a brief mention about my dual band antenna. It’s a design by Ed Fong, WB6IQN, that resonates at both 2m and 70cm much better than similar dual-band antennas that are generally a compromise design in one way or another. Ed’s grad students assemble and tune the antennas before shipping them out, and it’s supposed to have an SWR of under 1.5 over almost the entire 2m & 70cm ham radio bands. 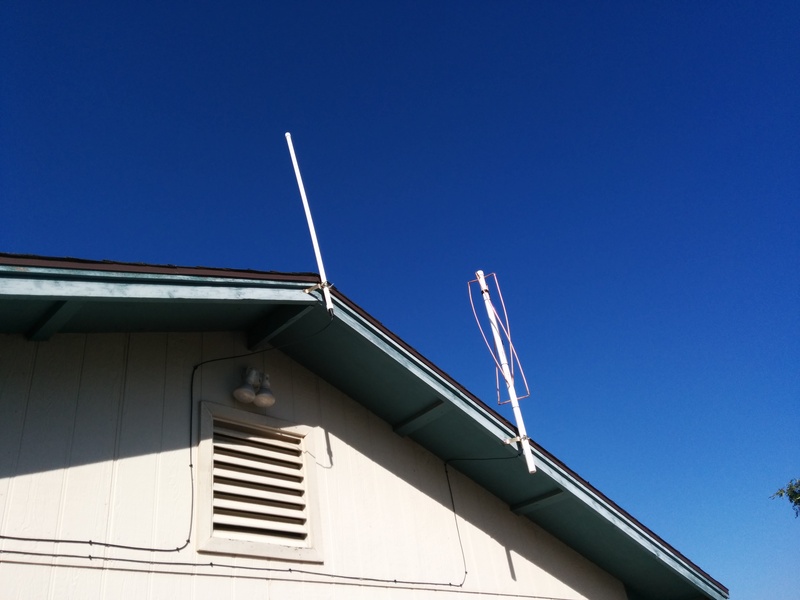 Ed sells the antennas on EBay for only $27, and all you have to do is pick up a piece of thin walled PVC to stick it in. I’m looking forward to doing some testing of the antenna’s range to see what it can really do. Getting it above the roof line instead of my mag mount sitting indoors is certainly going to be a big improvement, as is going to this half-wave design over the 1/4 wave I’ve been using. Hey you seem like one happy Dad. Have a couple of 18 element arrays yagi antennas 2.4 ghz around here with 1 watt bidirectional amps if your need them. Also Have some plug and play repeaters that I use to piggy back off my nice open network neighbors within a quarter mile away. Let me know here is my phone 480-734-0744. Prefer text but calling works also. This is Pete your amigo from Devry.